What Is Noise in a Digital Picture? If you've been using digital cameras for a while, you're used to seeing a lot of noise –a lot of often brightly-colored dots scattered throughout your image. Similar problems plague film cameras when using high-speed film. When noise is on actual film, it's called grain. Noise is caused by the digital sensor attempting to record tiny amounts of light. Basically, the camera is trying to record what is too dark to record clearly and–as a result–stray electrical signals wind up on the finished picture as flecks or noise. The faster ISO you set on your digital camera, the more noise increases as it picks up smaller and smaller electrical signals. Why Does One Camera Have More Noise Than Another? Digital cameras convert light into electricity and then that electricity is converted into pixels. Each camera manufacturer uses different sensor chips and software to handle these conversions. As such, some cameras are better at reducing noise than others. In addition to software, the size of the sensor itself and the number of pixels on that sensor can affect the amount of noise and how big the flecks are when noise does occur. How Can I Reduce Noise? Photography is an art form that's often been about compromise. If you need more light, you need to open up the aperture or slow down the shutter. But that can introduce unwanted effects. Luckily most modern cameras are pretty good at reducing noise. Smartphones, however, haven't quite caught up (they have smaller sensors) and are more susceptible to noise. The best way to reduce noise in any camera is to reduce the ISO (that is, the sensitivity setting of the camera's recording sensor) and add more light to the picture. That's not always possible, of course, which is why the industry is working on making better sensors. If you are looking for a specific ISO, look to shoot under ISO 800. Another idea is to avoid long exposure pictures. 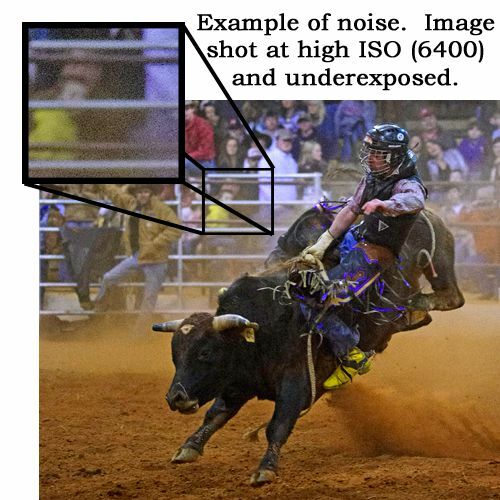 The longer the sensor is recording the better chance of introducing noise to the image. If you have some experience with photo-editing software, you can reduce the effective appearance of them by slightly overexposing your picture and correcting in post-processing. If you underexpose you will brighten the noise as you brighten the picture in post-processing.